John Yarrow has been sewing balloons back together for as long as anyone cares to remember. Originally working with Thermal Aircraft, set up by Tony Patey shortly after Thunder Balloons became Thunder & Colt, few realise that John is a jeweller by profession and a very fine one at that. In the uppermost regions of his house, buzzed by Chinooks, Spitfires and Grobs he has built a complete workshop and from time to time creates the most wondrous articles in gold and silver. 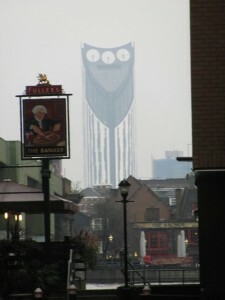 He is well known in the village for repairing broken gold chains and the more complicated bits of treasured jewellery. To see a gold chain that he has made is something else. His inspiration comes mainly from the ancient Egyptians but the odd commemorative spoon is not without possibility. For years he’s been ‘umming and ‘arring about getting his own hallmark and finally, last year, he took the plunge and applied for one. 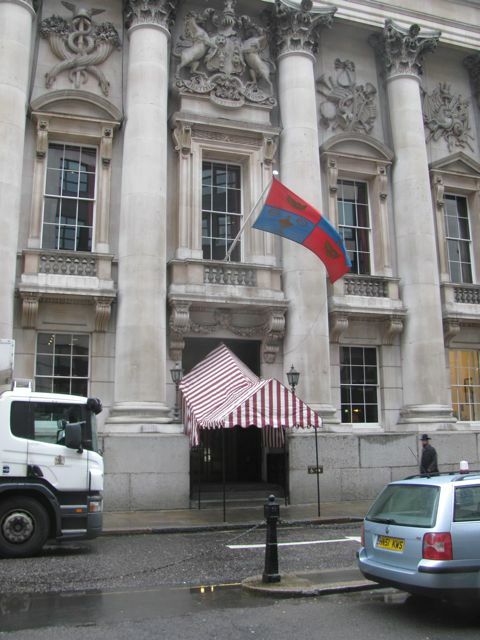 Now, one of the perks of being granted a Hallmark is that you get to have a poke around the Assay Offices in Central London, well, behind St Paul’s Cathedral actually. Did I want to join him as his sponsor? Its not everyday you get that sort of opportunity and so his arm was off and the date set. As they haven’t built HS2 quite yet we had to make do with Chiltern Railways excellent service to Marylebone which also ensured that we could celebrate afterwards. 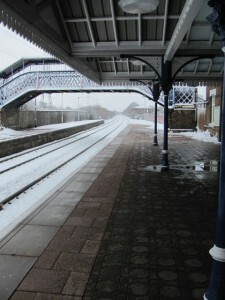 The snowplough had been through and the line was clear. It was still miserable old day when we emerged from the Underground at St Pauls but at least it wasn’t snowing just pouring down as we hurred round the corner through the magnificent portals of Goldsmiths Hall and into its panelled entrance hall. The Assay Office is at the back through a rather non-descript internal door with apparently rather relaxed security but we were assured that if hands were seen to wander then the very vigilant door-keepers would know about it and we’d never go home again. 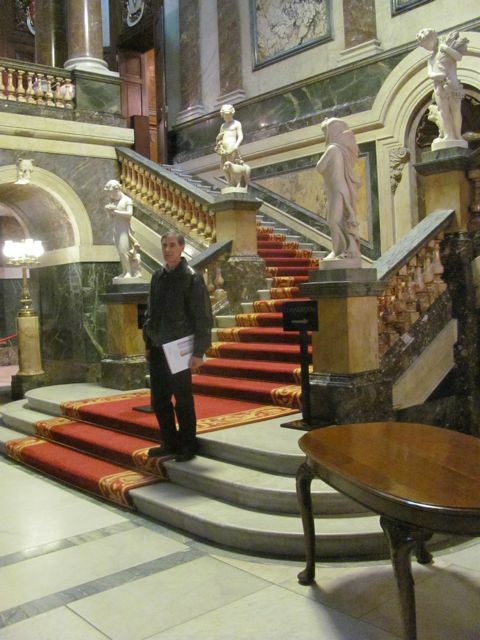 So hands in pockets we were invited through to the inner sanctum by our host Dave Merry, a very nice knowledgeable chap with over forty years experience in the trade and what he didn’t know about assaying, hall-marking and the precious metal trade was not of any relevance! The Worshipful Company of Goldsmiths, more commonly known as the Goldsmiths' Company, is one of the twelve great Livery Companies of the City of London and received its first royal charter in 1327. It was founded to regulate the craft and trade of the goldsmith and became responsible for testing the quality of gold, silver and, from 1975, platinum articles then, more recently, Palladium. The word ‘hallmark’ originates from the fifteenth century when London craftsmen were first required to bring their artefacts to Goldsmiths' Hall for assaying and marking. This legal requirement continues unchanged today and the Company still carries out its statutory function through the operations of The Goldsmiths' Company Assay Office. 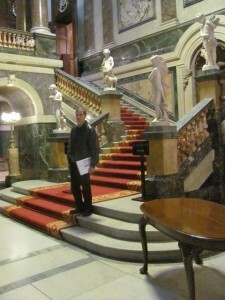 The current Goldsmiths’ Hall was built in 1913 and although we didn’t get to go into the main bit the Hallway is stunning and you have to go through that to get to the Assay Office but the customer entrance is round the back of the building. Once inside Dave took us through the entire process from receiving the gold artefacts to checking the purity and, when asked, forming gold bars. They use various methods for checking purity from the original touch-testing method by scraping the gold across touchstones, fire analysis, and electronically using XRS (X-ray) analysis. The guys that use the touchstones are incredibly skilled and can often tell the purity of the gold with amazing accuracy more so than the XRS machine! Touchstones are the most basic assaying tool you can get and are small blocks of lydite first used by the Ancient Greeks. By lightly scraping the sample gold across the block a coloured deposit is left. To the experienced this colour can be compared to a known colouration and carat so the purity can be determined. By adding known strengths of nitric acid the accurate purity of the gold can be further ascertained. It was amazing watching them going through pieces of jewellery checking each one to determine its purity. They can also identify plated gold this way but tend to use the electronic analysis but that can sometimes mis-interpret the graphs it produces so it seems that experience rules the day. Once the karat of the gold is proven them it can go on to be hallmarked. Now I’d never realised that according to the law a piece of gold can only have one hallmark on it which led us nicely onto the work of the fake and forgery department. 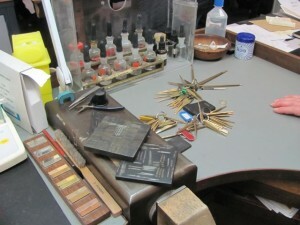 The London Assay Office is also the home of the Antique Plate Committee which was set up to check items of antique silver plate suspected of having contravened the Hallmarking Act. They had some brilliant examples of both forgeries and genuine early silverware created out of several individual pieces. When Dave asked us to spot the fake we had to admit we would have been fooled! Next door to this department is the all new laser hallmarking machine. This is an amazing bit of kit and means that fragile or very small items can now be hallmarked without the need for a hammer or stamping machine. John was soon trying to workout if his silver Hot Tom burner could benefit from this process. They can also use this for laser engraving the hallmark into a predetermined pattern as requested by some of the artists that submit works. John spotted a re-enforced plastic tub the size of a X-large LinBin crammed with gold artefacts. This was the scrap department. 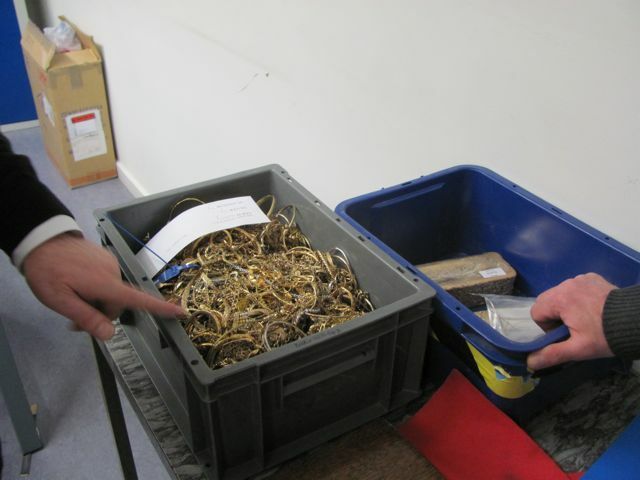 One of the apprentices was busy disassembling what they described as ‘the bottom of the jewellery market’ removing bracing from bangles or breaking pieces down into their components, separating out the gold from the rest. It was quite staggering how much scrap came in for conversion to gold bars. As John was somewhat nonchalantly invited to pick up a large standard sized gold bar Dave explained that one client brought in five of these bins a week and each bin full produced a couple of bars. John’s head went into overdrive. 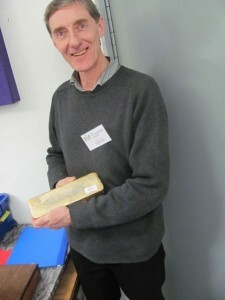 He was holding around £180,000 worth of gold! Recovered we returned to the hallmarking section where the hand punches were being used. Draws and draws of individual hallmarks were down one side all approximately in alphabetical order but as they were being added to all the time it was getting harder and harder to keep them in order so new stamps were filed in a special section awaiting filing. No computerisation in this department. “How do you know where to find the correct one?” we asked. “Between us we know where everything is in this place!” explained Dave. Combine that with the cameras and bar-coded tracking system allocated to every single piece that comes through we figured that they probably did. On the backs of the benchs were all sizes of letters and stamps to suit every possible application along with a fine variety of hammers. The thing was that this part of the Assay Office had clearly remained unchanged since it was formed in 1300 the only difference being the provision of electrical lighting. I wouldn’t be surprised if the workbenches weren’t the originals! I asked one of the ladies if she still appreciated the value of the objects that she was marking. She told me that on occasions a piece of work would come through that she would later see in an exhibition, that was the thing that made the job so good. Now for what on the face of it seemed such a simple process and all contained in a pretty basic office the look round was brilliant. Question followed question. The tour was supposed to last about an hour. Two hours in we were still there but a late lunch beckoned and Mr Dave had other things to do. His remit was huge from looking after the apprentices to chairing discussions on the latest scams so clearly his time was, like the materials he worked with, precious so we bade a fond farewell, passed the security check and were back stopped for a quick snap of John in is hallway and headed out back to the street. It had been brilliant and for the moment it wasn’t raining. Now, many years ago, when he lived in North London John as a small boy used to go upto Theobalds park in Enfield and lurking in a clearing in the woods was a gateway. Fascinated, he discovered it was Christopher Wren’s Temple Bar. Temple Bar is the point where Fleet Street in the City of London becomes The Strand in Westminster, today marked by a monument in the middle of the road with a Griffin, the emblem of The City on the top. 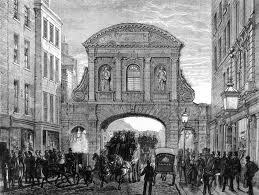 Temple Bar was originally a barrier built to control trade in and out of The City. 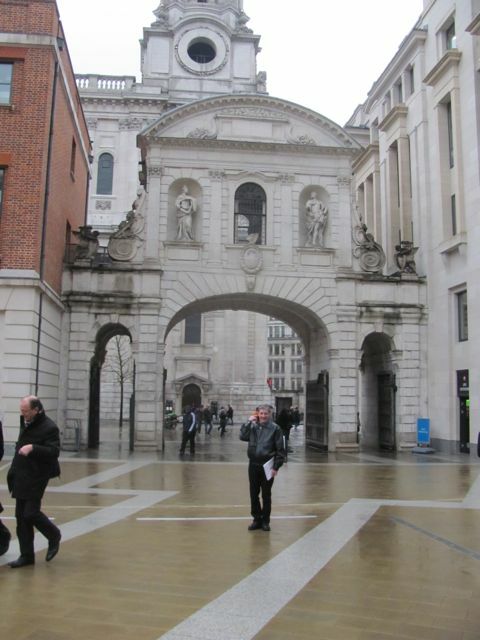 The Temple Bar John recalled seeing was originally erected on the site by Christopher Wren (well his mates) in the 17th Century. As the pressure of traffic built up and alternative routes into the City were found it was becoming a bit of a bottleneck so when, in 1874, it was found that its structural state was less than safe it was decided to demolish it. 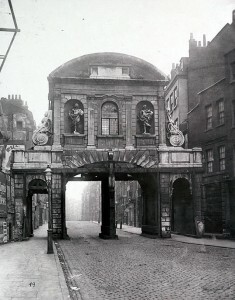 This was the most important of the London gates and as all the others had long gone the City of London Corporation of the day took the amazing decision to carefully dismantle and store it. 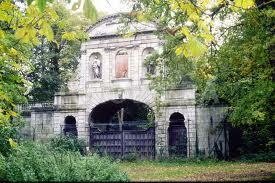 So it was that the archway’s 2,700 stones were carefully dismantled and put into storage until 1880 when the brewer Henry Meux’s missus decided that Temple Bar would look great as a gateway to their home at Theobald Park in Enfield. There it stayed rotting away and falling into disrepair until 1984 when The Temple Bar Trust purchased it for a quid and in 2003 finally took it apart and returned it to London. 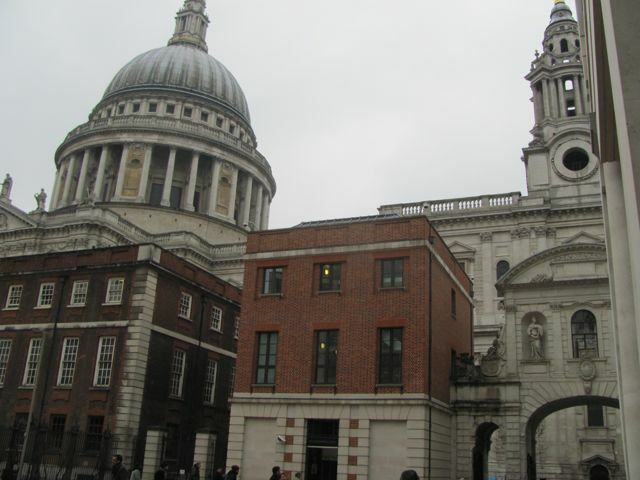 There had been great debate on where it should be re-erected but eventually, following the redevelopment of Paternoster Square next to Christopher Wren’s masterpiece St Pauls, it was opened on 10th November as the main entrance to the Square. We had meant to go and pay it a visit before but for one reason or another never got around to it so now was the time and walking across from the Goldsmith’s Hall into the Square there it was. Not as big as he remembered but nonetheless just as powerful in a decorated sort of way. What did seem strange was that the tourists didn’t realise its significance, well why would they with St Pauls making it look like a fireplace in comparison! We didn’t care and I took some touristy snaps of John gleefully pointing at it in a Japanese sort of way. I have to say it did look good. Now all we are waiting for is the return of the Euston Arch which they pulled out of a lock whilst building the Olympic Village complex. Boys will be boys so we headed off to The Banker, a Fullers pub built under the arches of Cannon Street Station for a libation. We’d well missed lunch but this is a great pub which serves a fine pint of ESB and if the weather is kind they have a beer garden overlooking the river and if not (which it wasn’t) there is a glazed gallery under the arches themselves which is equally impressive. 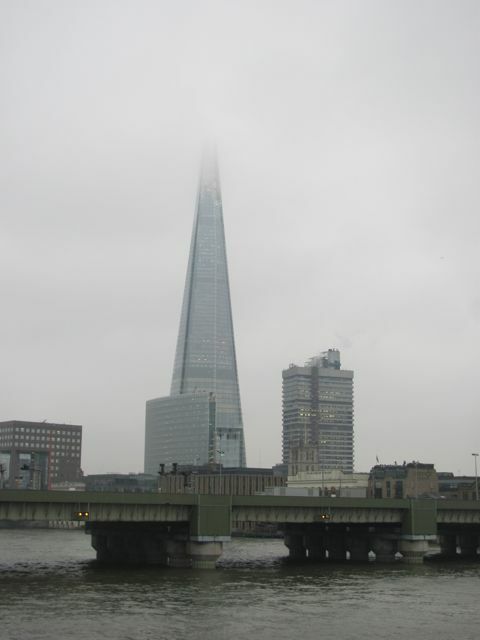 Suitably refreshed for the mandatory stroll over Southwark Bridge down to the Lord Clyde we set off. We’d only been up to town a few weeks before for our trip up The Shard and true to form it was in a cloud but what was far more spooky was the always staring threatening Owl at Elephant and castle. Nasty building we got out of its gaze and cut through the backstreets and fell into the Clyde and some well-deserved T.E.A. Then as if the trip hadn’t been great enough John presented me with a small gold bar bearing his first Hallmark. Perfick. Thankyou. If you fancy a trip round the Assay Office then you need to contact Dave Merry on 020 7606 8971) or email him dave.merry@assayofficelondon.co.uk Tours run from January to September but you’ll need to get in touch for specific dates. Costs is £17.50 per person plus VAT (free for new customers and students).